dimensional and sculptural way by using ribbon and other fabric materials. his early ages.His obsession towards animals becomes his major motif of his daily creation. 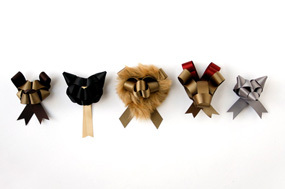 Recently, he is working with many colors of ribbon and creating various animals expression. chosen. so, none of the animals are the same. world, “the world of Ribbonesia” with full of life and joy. c2009 sakumotto all rights reserved.